Also, heads rolling in marketing department because LP with a cracked headstock made it into final marketing materials, unnoticed. I know the story behind this; Gibson sent the entire range to be photographed and 2 guitars got damaged in transit. They didn't have any other Traditionals in Tobacco burst because the production run hadn't began and it's a new color for 2018, so they actually had to glue the damaged one back together and photograph it as seen. No one realised that the break was visible in the pic until someone pointed it out to them. I'm sure Henry fired someone over it, he usually does. Everyone's calling it Truth In Advertising, 2018. They can't even ship to themselves without the headstocks cracking, lol. It's actually very sad. Sadder that they have to charge insane prices to try and survive. I just got a Gibson-era Kramer Vanguard off auctions. Looked too cool, but it IS indonesian. I'm concerned for the QC but we'll see. I can't even find any info on the vanguards besides the vintage ones either. I have nothing against Gibson since I've never really played one. The 20 year old Epiphone Les Paul my older brother has sounds great. However, Gibson doesn't really make a guitar I am interested in owning. Les Pauls, SGs, Explorers, Flying Vs and so on just do not look like comfortable or practical guitars. I also don't like 3 + 3 headstocks and single cuts. I'm not sure who thought the Explorer or V was a good shape, either. A guitar with a crack in it making it past final inspection should never happen, though. Someone should be fired for that. So per my last comment about the Vanguard, I have to hand it to Gibson and their Epiphone plant. That guitar plays REALLY good and the pickups are REALLY nice. Surprised how much I like a cheapy Indonesian Gibson-made Kramer. 2Plus2isChicken wrote: I'm not sure who thought the Explorer or V was a good shape, either. That would be me, when it comes to the Explorer. I have plenty of different shaped guitars, and nothing beats the Explorer for Balance and comfort. Especially when sitting down to play. The break at the strings causes massive tuning instability but the Explorer shape is awesome, I agree. And explorers are waaaay more comfortable than you'd think. Jeff's reluctance to make an Explorer shape is just so stupid. That thing would sell if you added a forearm cut to the upper horn, not an extreme thing like an aries but just a basic arm cut. Something like ESP's Arrow model. That would make it so much easier to play. That actually is one of my gripes about the V220 is the lack of a forearm cut. I think it could be a good "change" to an already great model. Agreed on the Explorer shape - My late Ibanez Destroyer was the only flattopped guitar I've ever really liked playing, and it was equally good sitting or standing. The lower bout was actually quite comfortable as an arm rest. Here's something about the Flying V shape most people don't seem to realize: you're supposed to play it "Spanish style," at about a 45-degree angle. This is easily accomplished when seated by putting your knee in the notch of the V.
Casual Madman wrote: Agreed on the Explorer shape - My late Ibanez Destroyer was the only flattopped guitar I've ever really liked playing, and it was equally good sitting or standing. The lower bout was actually quite comfortable as an arm rest. I love traditional V's, and I love my Les Paul Special. It's just the current management and their decision making that make me get the hives. Most of everything I love, including the new Viking that's coming in, are based on the brilliant luthiery of Gibson. I will say, NOTHING beats the sound and feel of my 335. It is my favorite guitar. Some of their guitar models I could live without. But Les Pauls are truly great instruments. You just have to play several until you find the "one" and have it set up to your specs. As I've said many times before...that company will have followers for an eternity no matter what. There's just too much music history associated with the brand. I absolutely LOVE a good Les Paul. Until I got my CS6 my #1 was my Gibson. I also have two Epiphones that play great. Almost every guitar I own is a variation of a Les Paul. LOVELOVELOVE! Doctor Doug wrote: Almost every guitar I own is a variation of a Les Paul. LOVELOVELOVE! I'm with you. For a good many of us, that configuration - single cut, carved top, double hums, weighty, set neck, shorter scale - just feels right. I'm a big old boy - 6' 3", big hands, long spatulate fingers - so you'd think a longer scale, larger bodied axe would fit me better. Nope. Not generally. I did bond well with my the late, lamented Destroyer (shorter scale, but bigger body) - but no other flattop has ever suited me. Including, sadly, my ST300. Me too. I'm about 6'4" -ish and have really long fingers. I'm skinny as hell though. Doctor Doug wrote: I'm skinny as hell though. I had an expressionless face, until I read this line.... Made me laugh. I get a funny cartoonish visual with that. But there is definite wisdom in this thread. Just took in my 4th 24.75 scale/PAF style humbucker guitar this week. And my two 25.5 scale axes... Are thick slab single cuts with buckers and PAFS. Ever play a slab Les Paul style axe, ie same build style just without the carved top,? Never cared for the Junior/Special. Had the same problem with my 1982 DC150 - never cared for the flat top. Might be 'cause my first two, cheaper guitars, were flatties. That Les Paul had "it." I was hooked, and even though it took me 37 years, I finally got another one - that might be even better. $1600 new at the DGIF this May. Was that a coil split you had on that Seventies Custom? What's nice about that Norlin Custom is that it escaped the dread Clown Burst Syndrome that afflicted so many bursts from that era. Yours had a nice gradual gradient, which is how it should be. "Les Pauls favorite guitar". It's a cute little article from Gibson, Les' sensibility of trying to extract as many sounds as possible informed the sensibility of so much of guitar building in the seventies and Eighties, even, obviously, Carvin with their stereo (like the ES) models with all the switching. Maybe Brian May took some ideas from Les? 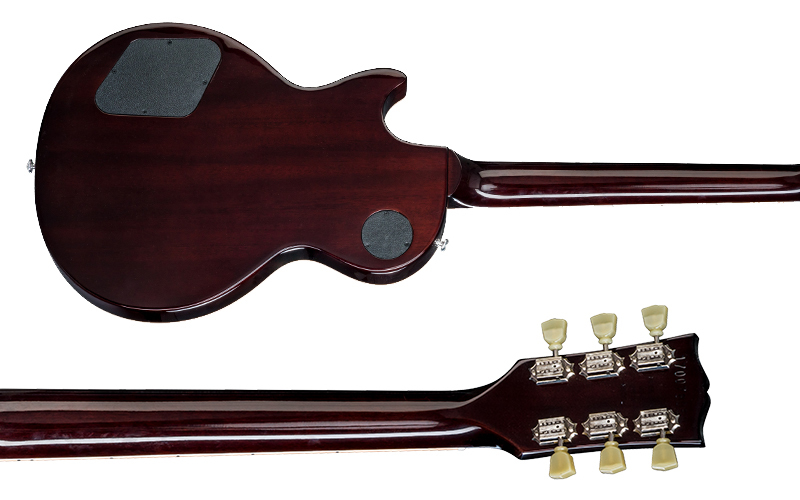 Having a phase out switch like that (Brian's Red Special has individual phase out switches for each pup) just seems like Brian may have heard of this guitar, or maybe Les saw the Red Special and took ideas from that? Dunno but it seems pretty cool.